Morning comes quietly and I'm up at first light. Within twenty minutes I'm packed up and riding past a silent village of tents and recreation vehicles. My spirits are up again, only my exhaustion and isolation were to blame for the depression of the night before. Soon the campground is gone, and I'm heading east toward the Elroy Sparta Trail. I won't be starting at the very beginning of the trail, but will join it after a few miles ride. This shortcut soon turns out to be one of the best parts of my trip. It's still very early, and there is no sound, no wind. The earth seems barely awake, pushing gently against the spell of the night, looking east, as I now look east at the rising glow of sunrise. We've lost our connection to the world around us. It's ironic that our ancestors used much of their energy and intellect to provide us with the comforts we now enjoy, perhaps dreaming of our modern world where they too could be well fed and safe. In bringing their dream to life, however, they took away many of the good things that the natural world provided. In our paved, wired, and mechanized world we're too far from the green of an open field, from the feel of the soil, from the sounds and smells of the creatures that share this world and watch our inexplicable behavior. We know something is missing, but we often can't imagine what it is. Speeding down the highway with other city dwellers, we glance at the land as it flashes by, but we miss all of the good that we need. As I ride through a narrow valley east of Leon, I realize that I too have this longing within me, and find that I'm riding through a place that stirs my imagination. The still air holds just a hint of mist that lingers over a dream-like landscape. 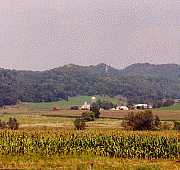 Tucked into a narrow wooded valley are several small farms. I ride in cool shade on a narrow road past ripening fields. The road slowly climbs as I approach the end of the valley. 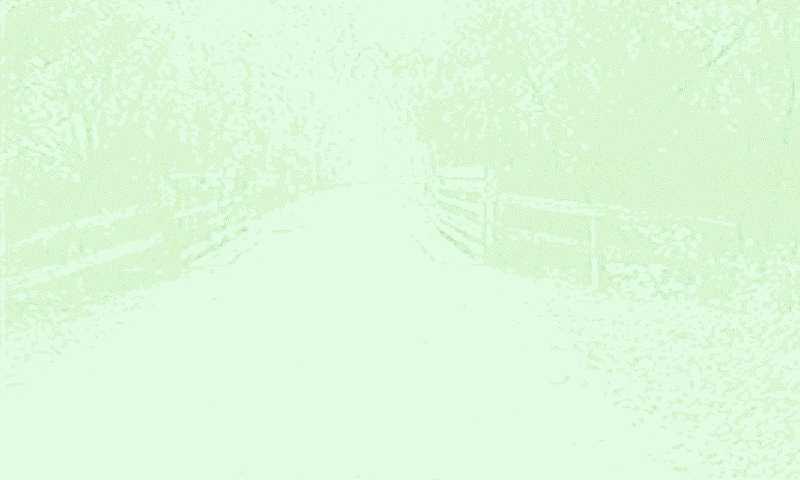 There is a small farmhouse and barn here, and the roof tops are just touched by the sun, leaving the land below in a cool rich shade of dark green. Now the earthy smell of farm animals drifts into me and a few turn their heads to see the odd character moving slowly down the road. There is quiet and order now, for it's not quite harvest time. I stop for a moment and gaze past a small fenced pen, past a well tended garden to the small house resting near the hillside. I imagine for a moment living here, and a feeling of relief and satisfaction flows through me. I wonder if the people that do live here pause during the day and feel the beauty of this place. Maybe it's only the things that we cannot have that we hold so high in our thoughts. I remember a neighbor that returned to farming after many years in a factory. When we visited one weekend, he was so exhausted he fell asleep at the dinner table. Perhaps it's better that I ride on, and keep my dreams intact. Now the road rises into sunlight and curves through gentle hills. The land opens and a breath of morning air begins to stir the tree tops. I'm at peace with the world now, the doubts and loneliness of the night before are gone. I look forward now to riding what may be the best bicycle trail in this part of the country. A few turns later I leave the roads and head down the Elroy-Sparta Trail. The trail follows an abandoned railroad bed of the Chicago-Northwestern railroad, and there are three 19th century tunnels that I will pass through on my way to Elroy. Now the morning is fully under way, and patches of sunlight fall on the path before me. It's just a bit cooler today, a perfect day for riding. The land around me is hilly, but the trail is flat with only a slight grade. The needs of heavy steam locomotives forced the railroad engineers of a century ago to cut through the hills and fill in the valleys. I stop and read one of the many information signs that explain how the railroad was constructed, and how the railroad workers lived long ago. The trail continues mile after mile through a wooded canopy. After an hour or so, I see highway 71 near the left side of the trail. 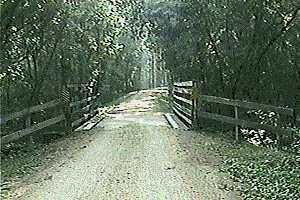 The canopy of trees opens, and the trail ducks under the highway through a short concrete tunnel. The path enters forest again, thicker this time. There's something here, something in the atmosphere, some change that I can't put my finger on. I follow a turn to the right and suddenly the temperature drops by about fifteen degrees. There's actually mist ahead, although the morning mist was gone hours ago. I peer ahead and spot the dark stonework of the first tunnel (tunnel No. 3) entrance. When I stopped at the trail headquarters earlier in the year to plan my trip, the lady that helped me gather information advised me to take a flashlight for traveling through the tunnels. I stop before entering and dig mine out. I can see the other side of the tunnel, way off in the distance, so I'm thinking that I may not need the light. Huge wooden doors hang on either side of the entrance. Small streams of water trickle out on either side of the pathway. I grab the handlebar stem of my bike and begin to walk. Not more than thirty seconds go by before I realize that I DO need the flashlight. I shine it now on the side of the tunnel and inspect the layers of sooty rock that close me in. The sound of running water echoes in the distance. Deeper still, and the darkness is complete. The tunnel entrances, far off in the distance, offer no more light than a sky full of stars. I turn off the flashlight for a minute and cannot see my hand in front of my face. The only sound is the crunch of gravel and the splashing of water. I come to a part of the tunnel where water drips from the top. A few minutes later I feel the air become humid, and fog forms on my glasses. Now the light streams in from the end, and I emerge into sunlight. 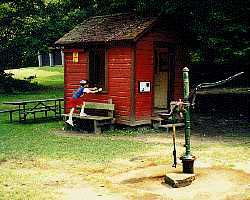 There is a small park near the tunnel where a tunnel watchman once worked long ago. Hanging signal flags, using the telegraph, opening and closing the tunnel doors, these were the activities that occupied the watchman as he worked his twelve hour shift through the winter. His responsibility was to keep eastbound trains from colliding with westbound trains. Apparently, there were times when fifty trains passed through each day! The trail continues through the welcome canopy of shade trees. A family on a day trip approaches. "Good Morning!" It's a beautiful day and I will meet many families on this part of my ride. 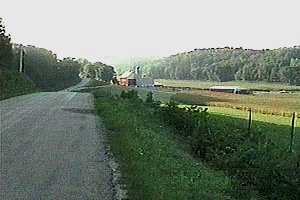 I ride on for a while, and the trail opens as it passes through farmland. 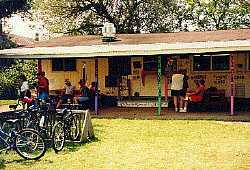 There's a sign up ahead, a "bicycle trail billboard" for Judy's Cafe in Norwalk. I'm pretty hungry; the last decent meal I had was eighteen hours ago in Sparta. I pass a large parking lot where day trippers are unloading bicycles and kids. The trail crosses the highway; the cafe is at this intersection. Two men lounging at the cafe remember me from the Leon Valley campground the night before. I was apparently too foggy to notice other cyclists, or I would have gone over to say hello. Judy's cafe has a nice atmosphere, as though I stopped by a friend's home for breakfast. I'm now very hungry, so I order three pancakes. "You probably don't want to order three" says my waitress. "They're pretty big pancakes." I take her advice, and order only two. My hunger builds as I relax, listening to the small talk of the patrons that drift in from the town and the trail. Soon my pancakes arrive, thick and golden, with rich maple syrup and sweet Wisconsin butter. A dab of butter, a dip in the syrup, then a pleasure that I've enjoyed in my childhood home, the home of my children, and now on my home on the road. My waitress was right, I'm pretty stuffed when I walk out. Soon I am passing through the second tunnel. There are many riders on the trail now, the Elroy-Sparta seems to be very popular. It's getting warm now, and I'm looking forward to the small town of Wilton, just ahead on the trail.